Do you have problem keeping track of all your important documents like passport, birth certificate, medical records, or warranty for that expensive new fridge? I know I do especially with all the moves we have made in the last 10 years! Well, join me in NEVER ever losing your important documents again! Check out the FREE new App called TouchDox which is now available to help you save, organize and retrieve your critical life documents, whenever and wherever you need them. No more turning your house upside down, fumbling through drawer upon drawer, looking for important documents. TouchDox serves as a virtual personal assistant—helping you to manage digital and paper documents, even providing reminders when certain documents like bills need to be addressed. Available as a web app, mobile app for Android devices, and now the iPhone, TouchDox offers users the peace of mind that their critical documents are safe, secure and accessible at a moment’s notice. With Touchdox, you can add the physical location of your original copy, add alerts (which can be attached to any documents) and scan documents instantly from your phone, and many other features which not only will save you time, but will help you organize and access your documents better. 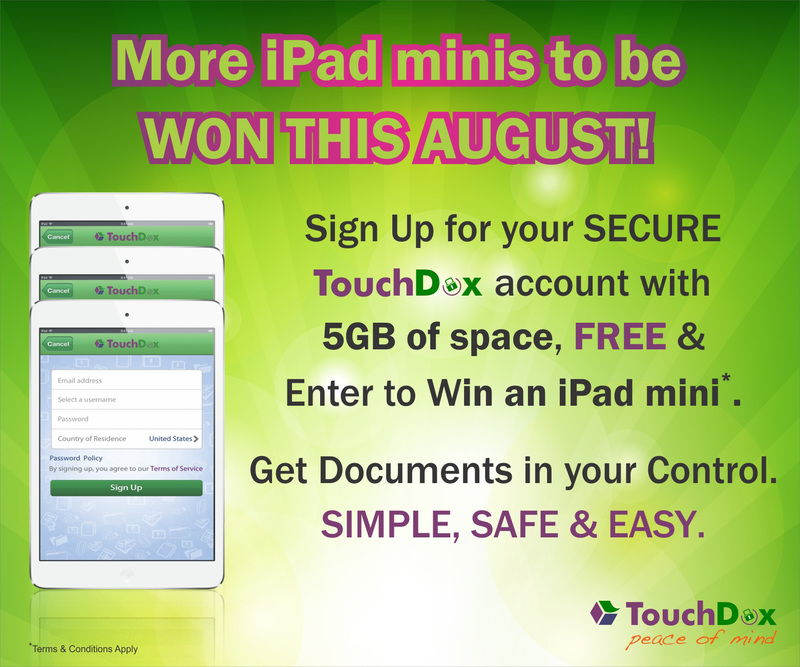 Plus, they are hosting their first iPad giveaway ending August 31st for signing up for Touchdox. 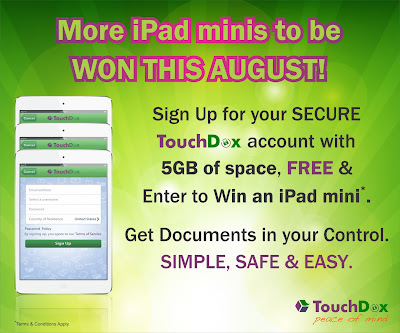 So HURRY OVER to www.TouchDox.com, sign-up and get started—and organized—for FREE! Looks a crap application to me esp when there are so many better doc mgmt solutions available with so many features. This doesnt have even basic stuff working....dont know who is the bonehead behind this product..